Earthquake. When you hear this word, you usually think California. The state's largest seismic events are often chronicled using maps, whether it's to tell the story of a historic disaster such as the San Francisco earthquake of 1906 or to inform the public about cleanup and repairs after a recent high magnitude quake such as the one that recently shook Napa Valley. 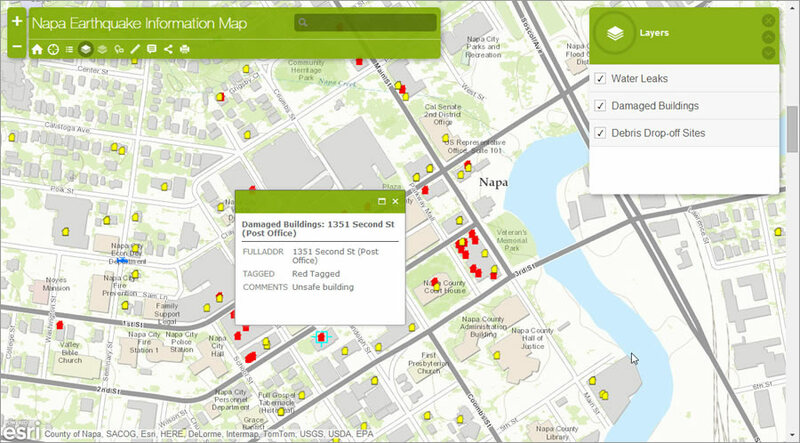 The City of Napa used Esri technology to keep the public updated about damaged buildings and other infrastructure after the 6.0 magnitude temblor struck on August 24, 2014, injuring more than 200 people, setting off fires, and knocking out power for tens of thousands of residents. 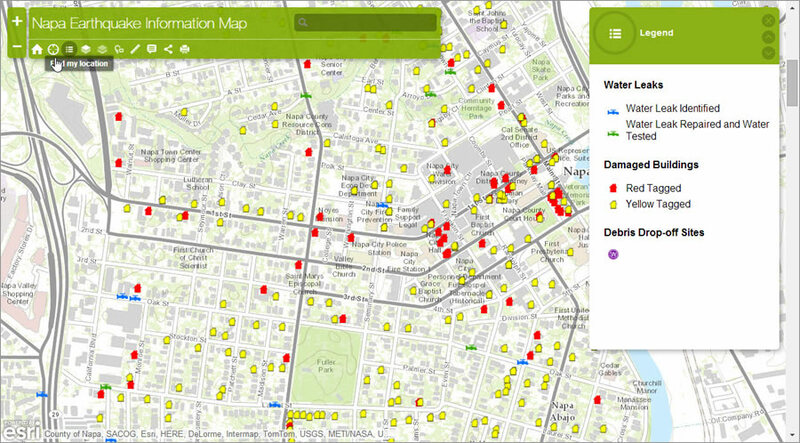 The city's app, created using the ArcGIS Online Basic Viewer app template, shows the locations of damaged buildings, water leaks, and debris drop-off sites. By clicking on a yellow- or red-tagged building on the map, you will see details about the damage such as a cracked chimney or collapsed carport. The map is being updated, too, showing for example where water leaks have been repaired. The largest quake on record in the San Francisco Bay Area was the 7.8-magnitude earthquake that hit San Francisco in 1906. According to a Wikipedia entry, the quake and associated fires are considered one of the worst natural disasters in the United States, having destroyed nearly 80 percent of the city and claimed roughly 3,000 lives. 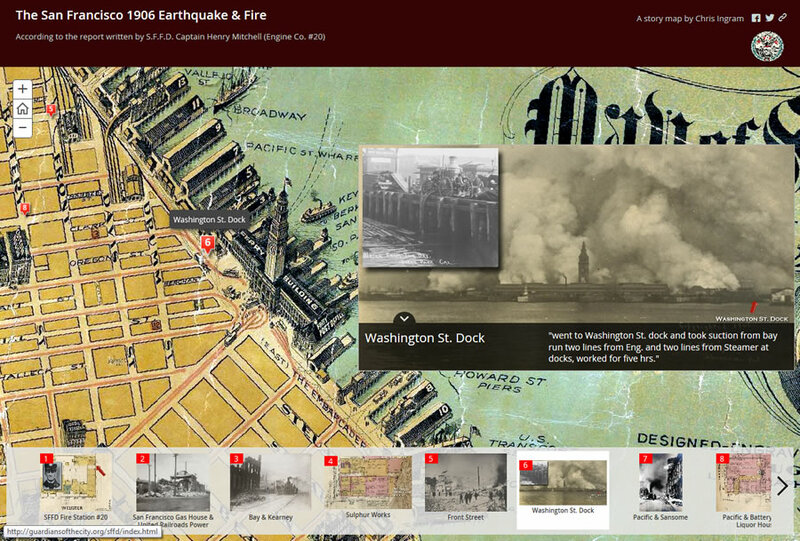 The San Francisco 1906 Earthquake and Fire interactive map, created using an Esri Story Map app, chronicles the tragedy. The app was authored by Chris Ingram from the Santa Clara County Fire Department, based in Los Gatos in California's Bay Area. The map tells the story of the disaster through the words of Henry Mitchell, a captain in the San Francisco Fire Department at the time. 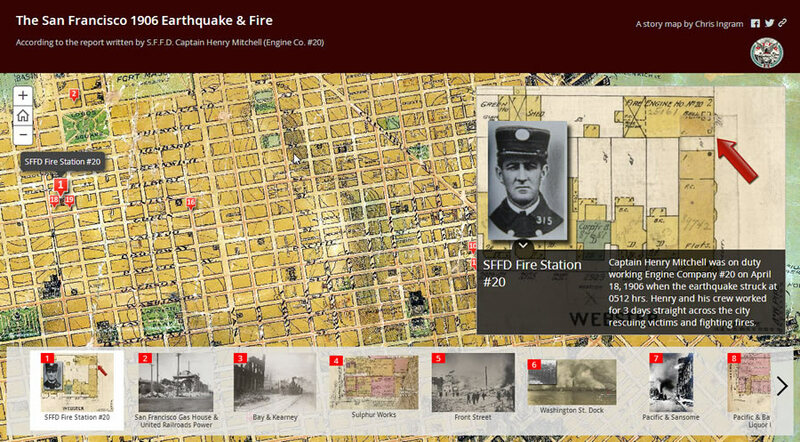 The Story Map app's historic map of San Francisco was georeferenced and published as a hosted tile service. Along with historic photos and other maps, this map brings Mitchell's words into context. I think it's a great example of how words, photos, and old maps can tell a compelling story about the past, with messages that still have meaning today. There are thousands of significant faults in California where earthquakes can occur but the San Andreas Fault—which runs through the state and forms the tectonic boundary between the Pacific and North American Plates—is the most famous. The likely source of the now overdue "Big One"—quake exceeding a magnitude 7—will likely occur along southern reaches of the San Andreas. When I first moved to Southern California from tectonically tame Pennsylvania, a friend joked that among other interesting benefits the state offers, I'd also enjoy a ringside seat to plate tectonics in action. I think of that every time I feel an earthquake. And as I look out from my patio in and view the mountain landscape created by the San Andreas and related faults, I sometimes fear the Big One.